Turkey's richest 100 individuals command an overall wealth of $111.8 billion, according to a study by Forbes magazine. The number of Turkish dollar billionaires increases to 36 from 23 in 2007. Turkey's richest 100 individuals command an overall wealth of $111.8 billion, according to a study by Forbes magazine. The number of Turkish dollar billionaires increases to 36 from 23 in 2007. Mehmet Emin Karamehmet tops the Forbes list with $4.3 billion, followed closely by ?ar?k Tara and Hüsnü Özye?in. Seventeen families control 60 percent of the total wealth of Turkey's richest 100. 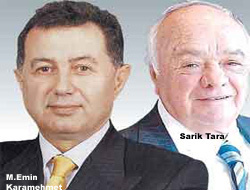 Turkey's wealthiest person is Mehmet Emin Karamehmet, owner of Çukurova Holding, according to the ?100 Richest Turks? study by Forbes magazine. The magazine cover read ?The Return of Karamehmet,? since the Çukurova boss ranked second last year. The number of Turkish dollar billionaires, which was 23 in the 2006 list, reached 36, and the total wealth of the top 100 reached $111.8 billion. Fifteen new names were added to the Forbes list, which includes 106 wealthy individuals. The total wealth of the 36 billionaires is approximately $61.2 billion. Karamehmet's wealth comes mainly from Turkcell, but $1.5 billion is estimated to come from other companies of Çukurova Holding, said the magazine. The group consists of 185 companies and has entered the betting market through ??ddaa,? a football score betting game, which has an annual turnover of $1.5 billion. Çukurova is also active in the energy sector, with its company Genel Enerji currently working on an oil field in northern Iraq that may have a $5.5 billion potential. The company signed a 25-year partnership agreement with the Iraqi Kurdish administration in 2002 on the Taq-Taq field. The field is estimated to have a reserve of 750 million barrels, which might mean $750 million annually for Karamehmet. Çukurova owns 70 percent of Genel Enerji and Geden Line. Tara of Enka, known for its real estate and construction activities in Russia and Turkey, ranked second, with a wealth of $4.1 billion. Tara doubled his wealth in one year. Özye?in, who sold Finansbank to the National Bank of Greece in 2006 and who ranked first in last year's list, came in third with $4 billion. Özye?in's wealth was $3.5 billion last year, said Forbes. While 13 new U.S. dollar billionaires made it onto the Forbes list, Çi?dem Sabanc? and Suzan Sabanc? Dinçer, who share Sabanc? 's shares in Akbank, both fell a little short of $1 billion, with $950 and $930 million, respectively. But Ahmet Çal?k, who officially took over the ATV-Sabah media group this month for $1.1 billion, made it onto the billionaires list for the first time this year with $1.5 billion. The money to be paid for ATV-Sabah was not included in their calculations as it is not yet certain how much of it will be financed by credit, Forbes said. - Forbes Turkey's list includes 106 names, with a total wealth of $111.8 billion. Mehmet Emin Karamehmet of Çukurova Holding, at the top of the list, commands $4.3 billion, while Necati Akça?l?lar of Tekfen Holding ranks 106th with $550 million. - Seventeen families control 60 percent of the total wealth of the 100 richest Turks. The total wealth of these families has reached $67 billion. - The Sabanc? family is represented with 14 individuals in the top 100, commanding $11.3 billion, while the Koç family is represented with seven people commanding $9.6 billion. - Forbes Turkey declared 47 Turkish dollar billionaires as of December 2007, but the figure changed after the global credit crunch. The magazine's latest list, dated Feb. 8, includes 38 U.S. dollar billionaires.